History has interesting ways of repeating itself. 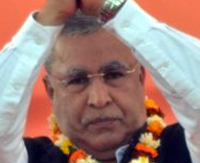 The day the senior citizenry trekked to Bulbul Nawagam in Islamabad periphery to pay their tribute to the slain in Pathribal massacres, Farooq Khan one of the key persons whose involvement in those incidents is believed but hitherto not proved, joined BJP. Narendra Modi, BJP’s PM candidate who was in Hira Nagar praised Khan for his fundamental role in crushing militancy while accepting him into the party. Modi in fact began his address by welcoming the IPS officer and former IGP Farooq Khan. Modi said BJP was the natural option for those who would aspire for unity and integrity of India and want to serve the poorest of poor in the country. Khan termed Modi “a phenomenon” and BJP embodying “nationalistic spirit”. He is keen to work for the part as its dedicated worker. Khan who retired as head of the Sher-e-Kashmir Police Academy Udhampur at the rank of IGP, is known for his leadership role in becoming the first head of the anti-militancy Task Force (also called Special Operations Group). During his career in the counter-insurgency, Khan was the most feared name in Srinagar. Given the power that his position enjoyed, he was law onto himself. He commandeered various actions against the militancy while sitting on the margins. He specialized more in interrogations and putting the pieces of the story together. But a low-key Khan, became an instant newsmaker during his stint as head of SOG in south Kashmir Islamabad when in March 2000 a series of killings started with the Sikh massacre at a time when Bill Clinton was on a visit to India. Within days after the massacre, Khan’s SOG was found involved in the killing of protestors in Bulbul Nawgam and soon after with army, they killed five civilians and dubbed them foreigners. The arrest of Yaqub Wagay from a village near Chattisinghpora and dubbing him an accused in the case was also part of SOG’s doing in Khan era. As the series of events were investigated, Army has been maintaining that they acted on the intelligence that state police passed to them. But Khan has been denying it throughout. There are not many things on record to suggest Khan was involved but everybody within and outside the system knew he was never an innocent. After the five civilians were exhumed against Khan’s wishes, a sensational exposure embarrassed the system as samples were found mixed. The state government appointed a commission led by Justice (Retd) G A Kuchhai. It found Khan responsible for fudging. Shifted from south Kashmir, Khan was placed under suspension twice and both the times he was reinstated. Last summer, he honourably retired from the services. As army is taking multiple routes to come out of Pathribal massacre and seeking Khan among the accused, Khan is already a BJP leader. Wearing the president’s medal for the ‘meritorious services’ and innumerable commendations by the army and other security agencies, Khan has the perfect profile to be a BJPs poster-boy. But many think, Khan’s joining BJP is just a home coming. His grand-pa Colonel (retired) Peer Mohammad Khan was the first state president of the J&K’s Jan Sangh. This colonel of Hari Singh’s army had a major contribution in the 1947 happenings in Jammu. So there is nothing new. The only regret that Khan might have had while shaking hands with Modi was that L K Advani was missing in the frame. At Chattisinghpora, Khan had briefed Advani for around 15 minutes about his Pathribal success and got public appreciation for that.